Dare to fly high? Then go for aero sports with the sky as your playground. Get over the fear of height, try Parasailing. Parasailing is a sport that is a blend of skydiving. Parasailing and Paragliding are quite similar to each other with the only difference that Parasailing is conducted on a open ground with a parachute tied to a Jeep. Whereas in case of paragliding, gentle hill sides are usually the launch sites for the performer. The best season for flying ranges from September to February. 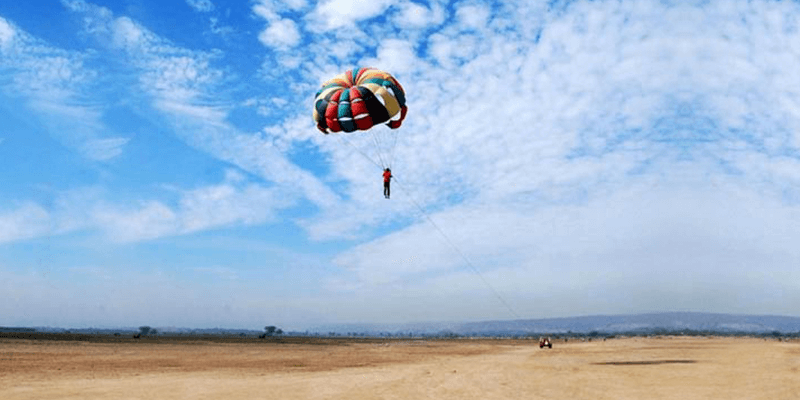 In open countryside of the desert land, Rajasthan serves to be one of the suitable sites for Parasailing in India. The runways and strips in Jaisalmer prove to be a remarkable site for Parasailing. Parasailing is one of the most adventurous yet safest aero sports being carried out in prominent adventurous destinations all over the developed world. It is conducted on ground under the vigilant eyes of a Qualified Parasailing Instructors. Jaisalmer Taxi Services is delighted to introduce the excitement of Thar Desert of Rajasthan with the desired luxury and adventure adding to your travelling experience. Since the inception in 2003, Jaisalmer Taxi Services has been an industry expert in Desert Jaisalmer Taxi Services. We provide Luxurious and Adventurous experience in the Thar Desert with the exciting activities such as Sam sand Dune Safari, Parasailing, Para-Motor Gliding, village safari, jeep safari, camel safari and Arabian Nights etc. Jaisalmer Taxi Services one of the best traveling agency in Rajasthan. Jaisalmer taxi services has 20 years of experience in rajasthan tourism specially in jaisalmer . The objective of this company is provided excellent service to the visitor under one roof starting from taxi, safari, camping in jaisalmer & much more.